Frank Partridge & Sons, dealer; from whom purchased by Sir William Burrell, 29 October 1946, �50; by whom gifted to the Corporation of the City of Glasgow, 1946. 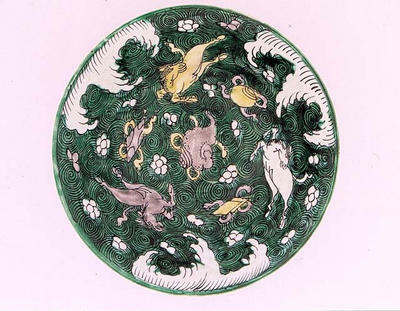 Sir William Burrell, Purchase Book 1946, p.84: �Large Chinese porcelain bowl in bright green decorated with whorls and galloping horses, in aubergine & single white flower heads. Ming. 8 1/2" diam�.